Designed for group cardio workout classes, the hollow 54" (4.5ft) bar weighs only 5 lbs and can safely hold up to 65 lbs. Perfect for light aerobic and training classes. This bar is one piece, not a cheap department store bar that bolts together in the middle. 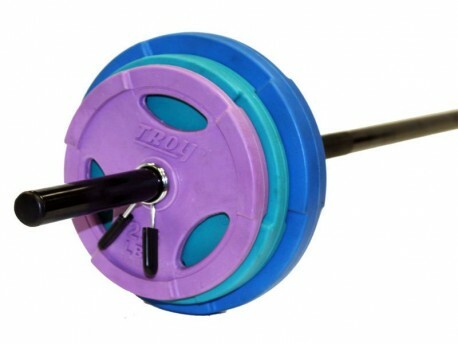 The color-coded plates help you make sure that everyone in the class is using the right weight. They have a rubber coating and grip holes for easy handling. The plates also have a steel insert in the center hole to make them slide against the bar smoothly and protect the surface of the hole. The hole is a little larger than past models of this plate so will be a loose fit on some bars.